A horse seen stuck in a corral before Ventura County firefighters successfully rescued it on Saturday, Sept. 30, 2017. 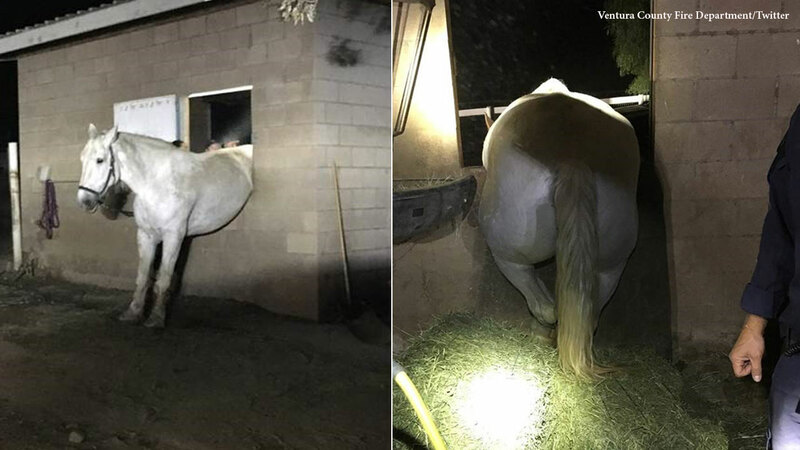 SOMIS, California -- A horse in Somis, California had to be rescued by firefighters after attempting to get out of its corral to be with its friends. Ventura County firefighters responded to the 8500 block of Waters Road at about 8 p.m. Saturday to help free the horse. Fire officials said it took about an hour to successfully get the horse out of the corral. It had no obvious signs of injuries but a veterinarian was called to the scene as a precaution. Fire officials tweeted that the horse got stuck while attempting to "be with companions."